Enzyme-linked Immunosorbent Assay (shortened as ELISA) is used to identify peptides, proteins, antibodies and hormones. Also, called as enzyme immunoassay (EIA), ELISA finds use in the fields of biotechnology and medicine as a diagnostic tool. Mainly, antibodies and color changes are used to identify target substances. Also, ELISAs are useful in measuring antigen and antibody concentration. Before the advent of ELISA, radioimmunoassay employing radioactively-labelled antigens and antibodies were used. Radioactivity served as the reporter signal indicating specific antigen or antibody. As radioimmunoassay posed significant health risks to researchers, alternatives were sought. In 1960s, Enzyme linking process was developed by two different teams spearheaded by Stratis Avrameas and G. B. Pierce. In the same period, immunosorbent preparation technique was published by Wide and Jerker Porath. Independent research papers published in 1971 by Peter Perlmann and Eva Engvall at Stockholm University in Sweden, and Anton Schuurs and Bauke van Weemen in the Netherlands produced the knowledge that go into making ELISA. Technically, newer assays use reporters that are not enzymes in most cases, nonetheless the underlying principles of the assays are similar. Therefore, these assays are grouped as ELISAs. ELISA works by coupling antibody or antigen to assay enzyme. The assay combines the specificity of antibody and sensitivity of assay enzymes to primarily detect antigens through assay antibody or antibodies through assay antigens. The sensitivity and precision of the assay is enhanced by coating the plate with high-affinity antibodies. ELISA (enzyme-linked immunosorbent assay) was devised as an alternate approach for radioimmunoassays during the early 1970s. This is a plate-based assay intended towards recognition and quantification of proteins, antigens, peptides, antibodies and hormones. The elementary enzyme-linked immunosorbent assay (ELISA), or enzyme immunoassay (EIA), is different from the other available antibody-based techniques in a way that in a polystyrene (96 or 384) multi-well plate (which is considered good for protein binding) the binding to solid surface sequentially results in the identification of specific reactions excluding the non-specific ones. This results in the generation of quantitative results. It is this obligatory binding and immobilization of components that is unique to this process making ELISAs exclusive and easy to implement. The participating reactants in ELISA that is immobilized to the surface of the microplate enable differentiation of the reactants that have bonded out of the non-bound unspecific reactants throughout the analysis. In an ELISA, the antigen or antibody is bound onto a solid surface usually onto a micro-well plate and thereafter it is interacted with a counterpart antigen/ antibody. The counterpart antigen/ antibody is connected to a reporter molecule like an enzyme or alternatively can be detected by a secondary antibody that is in turn linked via conjugation to an enzyme. The detection of the assay is carried out by evaluating the enzyme activity of the conjugate which is implemented by incubation with a suitable substrate for the enzyme resulting in a generation of a quantifiable product. Generally, the ELISA technique results in a colored end product which absorbs at a particular wavelength and can be correlated to the quantity of analyte in question present in the sample. An extremely specific antibody-antigen interaction is the utmost critical component of the entire process. This capability of the process to wash away non-specific unbound reactants makes the ELISA technique an influential and reliable means for gauging precise information on the analytes even when present within a crude and impurified sample. ELISA has been implemented in diagnostics as well as for quality-control programmes throughout a number of industries. They are rapid and easy to carry out, and because they are premeditated to swiftly carry out high throughput screening and multiplexing, they have made a breakthrough in the widespread assessment of various investigations as well as diagnostic assays. ELISAs have retained their position in extensive use either in their original form or in extended forms with certain amendments allowing for more than two analytes in each well, extremely sensitive data, and straightforward output. These assays function on many similar principles as when compared other immunoassay techniques available. In the interest to make the most of it in terms of the sensitivity and accuracy of the assay, it is required that the plate is coated with great care using high-affinity antibodies. It is to be noted that, ELISA can be implemented to perform other types of specific ligand binding assays as an alternative to only immunoassays. This process necessitates the use of a ligating reagent immobilized on the solid support which in presence of a specific detection reagent can implement an enzyme-substrate reaction to generate an output signal that in turn helps in quantification. The process begins with coating the multi-well plate with either antigen/antibody usually taking 30 min to overnight incubation which is followed by primary antibody reaction for 2 hours after blocking. Then the application of secondary antibody is carried out with further incubation for 2 hours, thereafter substrate preparation is generally done freshly just before the reaction and finally development which takes near about 30 mins. The components in the ELISA are immobilized which makes the process easy to perform. But as the assay requires the use of surface binding for appropriate separation, washing is carried out several times repeatedly after each step inorder to ensure removal of unbound entities. The excess fluid is to be necessarily removed during the course of the reaction in the interest to prevent the unwanted dilution of the reagents that will be added in the subsequent steps. For ensuring the desired uniformity dedicated plate washers are implemented in this process. As ELISAs incorporate multistep reactions it can become quite complex in case of measurement of analyte concentrations in case of complicated samples such as blood as there is a presence of a significant amount of analytes that can interfere with the measurement. Herein, the role of the detection step becomes important where the signal amplification can be achieved via the use of several coatings of antibodies. A color producing substrate, like Tetramethylbenzidine (TMB), in staining. It produces the color based on an enzymatic reaction. The substrate can be chosen based on the instrument available like in case of colorimetric reactions spectrophotometers are used and in case of a fluorometric tag fluorimeters are implemented. The ELISA experiment primary initiates with the step of immobilizing antigen of a given sample into the the wells of a multiwell plate. The process of immobilization can be attained via two methods which include direct adsorption to the surface of a plate or through an antibody capture probe adsorbed to the plate. The antibody probe must be highly specific towards antigen of interest. The immobilization is trailed by addition of detection antibody that results in an antigen-antibody complex. The antibody applicable for detection is usually tagged exploiting enzymes like alkaline phosphatase (AP) or horseradish peroxidase (HRP). ELISAs can be classified into following four major categories namely direct, indirect, sandwich, and competitive depending on the modifications performed to basic procedures. Sandwich ELISA is the most powerful format in ELISA assay due to its high sensitivity and robustness The substrate choice for the assay depends upon the requisite sensitivity, the type of the instrumentation required and its availability. The detection via direct ELISA procedure is much faster as compared to other ELISA techniques due to limited steps followed. This technique allows for coating of antigen directly to wells of microtitre plate which is followed by the addition of enzyme labelled primary antibody that detects the antigen that is complementary. The assay is beneficial as it is minimally error prone due to the implementation of a lesser number of steps requiring only a handful of reagents. There is no requisite of cross-reacting secondary antibody in this technique. But this technique poses a few disadvantages with regards to its specificity. Since specificity of antigen immobilization is low, there is an occurrence of higher background noise as compared to other ELISA techniques. This is due to the non-specific interaction of sample proteins along with target protein in a microtitre plate. 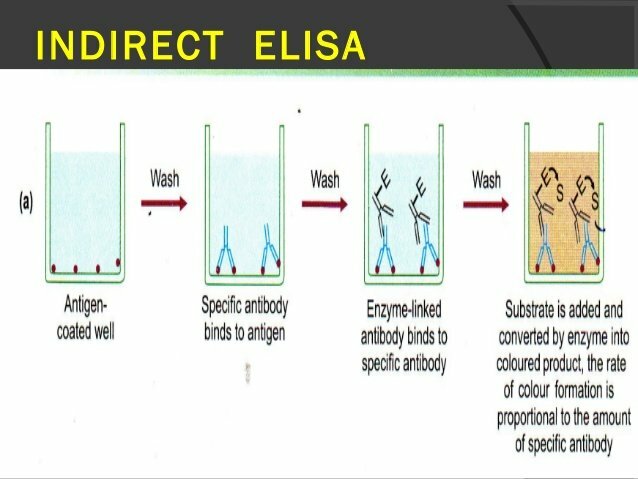 The flexibility of direct ELISA is minimum since each target protein is required to be bound by enzyme labelled primary antibody. The labelling procedure for each primary antibody is laborious and time consuming which would adversely affect its immunoreactivity. The lack of secondary antibody minimises signal amplification, that reduces the sensitivity of the assay. Therefore, the direct ELISA technique is preferred mostly to analyse the immune response towards an antigen. Fast and minimal steps involved in the procedure. Minimum precursor requirement makes it less error prone. The immobilization of the antigen is not specific due to which background related issues are seen. Offers less flexibility in terms of primary antibody. The absence of signal amplification reduces sensitivity. Sandwich ELISAs employs the usage of antibody pairs such as capture antibody and detection antibody which can be a monoclonal or polyclonal antibody. Each antibody is highly specific towards epitope of an antigen and the assay is found to be more suitable for antigens possessing two epitopes. The specificity of matched antibody pairs is very important to confirm their binding to different epitopes in obtaining precise results. 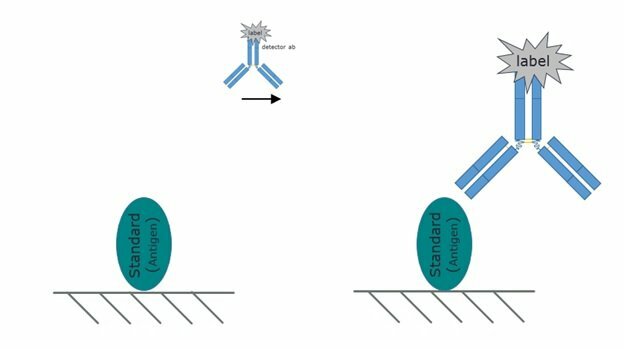 As its name indicates, the capture antibody interacts with an antigen which can then be detected via both direct and indirect ELISA techniques. Since the antigen quantification is taking place between upper and lower layer of antibodies, the entire method is termed as sandwich ELISA. A sandwich ELISA applied for investigation more often demands validation as it falls under the risks of delivering false positive results. Sometimes the development of the sandwich ELISA assay takes considerable time owing to the procurement of matched pairs of antibodies that is required. The primary step in sandwich ELISA involves coating of ELISA plate with a capture antibody. To this antibody coated plate, a sample containing antigen is added, followed by antibody detection. The detection antibody can be either enzyme labelled or enzyme unlabelled, depending on which it will be direct sandwich ELISA or indirect sandwich ELISA respectively. In indirect sandwich ELISA, a secondary enzyme-labelled antibody based detection is introduced that binds to the primary unlabelled detection antibody. Sandwich ELISA is found to be 2-5 times more sensitive when compared to direct and indirect ELISA techniques. The higher specificity of sandwich ELISA is attributed to the usage of two antibodies which detect the antigen of interest. Since the implementation of both direct and indirect methods is possible, the technique promises more flexibility in detection procedure. The analysis of a complex sample with high specificity and sensitivity is possible through this technique as it requires no prior purification of antigen. But the technique brings few disadvantages which are to be considered. It is important to have an optimised and tested ELISA kit for specific reaction and detection. The unavailability of standardised kit would demand the optimization of antibody to avoid cross reactivity of capture antibodies with detection antibodies which is time consuming. Direct Sandwich: With this type of assay an enzyme conjugated antibody is applied for detection or fluorescence moiety is used. After the incubation in presence of the immobilized antibody-antigen complex on the well of the plate, output signal detection is performed when the chromogenic substrate is applied or via exciting and collecting the emission signal of the fluorophore. Indirect Sandwich: Herein the assay uses consists of either an unconjugated or biotinylated antibody for detection purpose which when bound to the antibody-antigen complex can de be distinguished by either streptavidin or anti-species antibody conjugated to an enzyme or fluorophore. Introduces highly specific reaction due to the involvement of two antibodies for antigen detection. Both direct and indirect technique is implemented in detection. Optimization in terms of antibody becomes problematic due to cross-reactivity issues. For recognition of a specific epitope, only monoclonal antibodies can be applied as matched pairs. To procure monoclonal antibodies it is a tedious process in case of matched pairs and are more expensive than polyclonal antibodies. It is cheaper as there is a requirement of fewer labeled antibodies. Higher signal to noise ratio. Time consuming and extra labour required. The competition/inhibition ELISA which is otherwise termed as blocking ELISA is known to be a plate/surface based assay. It is one of the most complex assays performed above all the remaining ELISA techniques. However, it is to be noted that the other ELISA types can also be modified to fit into the competitive format. The working mechanism of this technique predominantly measures and quantifies the antigen or antibody concentration in a given sample based on the supposed signal output by resultant interference. Basically, it exhibits a competitive interaction of sample antigen or antibody to labelled antibody or antigen which is in limited concentration respectively. The obtained signal output is inversely proportional to the concentration of antigen in a sample where there is an output of a weaker signal at higher concentration of antigen. This example demonstrates primarily the coating of a known antigen on a microtitre well plate. After the completion of optimum blocking and washing procedures, unknown antigen containing samples are added. It is trailed by the addition of labelled detection antibody using suitable substrates like 3,3’,5,5’-Tetramethylbenzidine or TMB. The major step in competitive ELISA or inhibition ELISA is the process of competitive reaction between the target antigen present in the sample and antigen that is bound multiwall plates with the available primary antibody. The higher antigen concentration in the sample is denoted by a significantly lowered signal output. In contrast, antigen in the sample at a very low quantity will give rise to higher signal output. It is best applicable when the availability of antibody is reduced to one for the target antigen. It is also apt for distinguishing minor amounts of antigens that cannot be detected even by two distinct antibodies such as in the sandwich ELISA technique. In most of the cases, inhibition assays provide the sample to be tested the opportunity for preferential binding over other interfering components as it is added before them. In case of competitive assays, the target sample is first incubated with the other component before the reaction proceeds further. Less sensitive to experimental errors. The detection of the output signal in ELISAs is dependent on an enzymatic probe which produces a measureable signal proportional directly to the presence/amount of an analyte bound to a specific antibody. A variety of enzyme-substrate reactions are usually applied for ELISA detection and the ultimate output is measured with a microplate reader either in fluorescence or spectrophotometric mode depending on the type of substrate in action. The most commonly used ELISA detection strategy is that the labelling of the antibodies is carried out directly with alkaline phosphatase (AP) or HRP which produces a colorimetric output signal detected via spectrophotometer. These fall under the category of chromogenic assays which results in a product absorbing in the visible range producing a visible color where repeated washing is mandatory in removing interfering analytes. The antibody which is enzyme labelled produces a colored product via catalysis in presence of an appropriate substrate. Since the enzyme is highly efficient in conversion, the reaction can be proportionately sensitive in nature. Alkaline phosphatase derived from Escherichia coli has an optimum activity at pH 8.0 whereas the AP mined from calf intestines has optimal pH at 9.6. As a result, there are fair chances of a low enzyme to antibody conjugation ratio along with the steric hindrance concerns associated with the higher molecular weight of alkaline phosphatase in case of closely packed antigen-antibody conjugates ultimately resulting in lower activity. However, stable nature of alkaline phosphatase renders it applicable with a wide range of substrate molecules. A product insoluble in nature is generated by is BCIP/NBT (5-bromo- 4-chloro-3-indolyl-phosphate/nitroblue tetrazolium) and it is accepted as the utmost effective substrate in case of immunoblots as a result of its stability in presence of light. In case of production of a soluble reaction product p-NPP (p-nitrophenylphosphate) substrate is utilized that generates a product yellow in color absorbing at 405 to 410 nm. The sensitivity can be increased in this case by allowing a longer development time. This reaction normally takes half an hour to complete and can be stopped using 1N NaOH or chelating agents. However, the reaction takes extended periods of time to execute it is not recommended for kinetic analysis. One of the major disadvantages that hinder the use of alkaline phosphatase is that it is deactivated at acidic pH (< 4.5) as well as in presence of chelating agents. There is a requirement of specific buffers, wash solutions for the assay. Nevertheless, it offers a low signal to noise ratio with high sensitivity. Hydrogen Peroxidase typically binds to an antibody in a 4:1 ratio. It contains a heme group that absorbs at 403 nm in combination with an apoenzyme (enzyme) with an absorption at 275nm. The problem associated with steric hindrance is negligible in this case as a result of its low molecular size. Peroxidase is inexpensive as well as a number of substrates producing soluble otherwise insoluble products are abundantly obtainable for peroxidase. One of the major challenges associated with the use of peroxidase is its sensitivity to most of the preservatives present in buffer solutions that renders it inactive. Also, some of the metals present biological samples may interfere with peroxidase activity. However, by use of sterilised buffers and reagent grade solvents these problems can be mitigated to an extent. The utmost commonly applied substrates for peroxidase producing insoluble product are DAB (3,3′,4,4′ diaminobenzidine), TMB (3,3′,5,5′ tetramethylbenzidine), and the substrates giving rise to soluble products are TMB (dual function substrate), ABTS (2,2′-azino-di [3-ethylbenzthiazoline] sulfonate) and OPD (o-phenylenediamine). Out of these TMB that produces a blue product with an optical absorbance at 650 nm is a highly sensitive substrate and has a fast rate of reaction as a result of which it can be applied for kinetic studies. ABTS although less sensitive than TMB, produces a blue-green soluble product with an absorption at 405 to 410 nm and is available as a multipurpose substrate offering a wide working range. The rate of reaction in this case is suitable for end point studies. In a nutshell, the HRP based system is widely used due to its ease of implementation and economic feasibility even though its slightly less sensitive than AP. Fluorescence labelled antibodies when applied in detection of ELISA it is termed as fluorescence-linked immunosorbent assay (FLISA). Fluorescent based immunoassays involved an enzyme substrate reaction that produces a fluorescent product. The relative fluorescence intensity and the amount of analyte is proportional in nature. As compared to the colorimetric ELISA, the fluorescent assays are background free and hence more sensitive additionally also have a wide dynamic range. These are various formats similar to that of standard ELISA. The are various types of fluorescence or luminescence that are applied in immunoassays are bioluminescence, chemiluminescence, photoluminescence that vary in terms of the process by which the excited state is gained. Fluorescence or luminescence is supposed to be the most sensitive method of detection available because of its signal amplification properties. The enzymes mostly applied for fluorescence based immunoassays are also AP and HRP but with different substrates. As discussed above HRP can be applied in wide range of applications with an intense, stable signal in both bioluminescent or chemiluminescent formats. The appropriate substrates for fluorescence based assays involving peroxidase are luciferin, polyphenols, luminal (3-Aminophthalhydrazide), and acridine esters. In this luciferin is dependent on bioluminescence mechanism. Out of all, the widely accepted substrate is luminal and its derivatives applied in clinical diagnostics owing to its enhanced luminescence characteristics . The others are chemiluminescent based substrates that involve polyphenols demonstrating an outstanding signal to noise ratio and exceptional photostability. However, control of optimum pH is utmost important in fluorescence based detection. Its advantages include ultra-high sensitivity, wide dynamic range, low background. In this case, the antibodies are combined with biotin successively followed by an enzyme streptavidin conjugation stage. Unlabelled primary antibodies can also be applied consecutively to enzyme-conjugated or biotinylated secondary antibodies. In case the biotinylation of the secondary antibody is carried out then a further stage for detection purpose such as a tertiary step is required. Herein, the after addition of a suitable substrate the treatment with streptavidin-enzyme conjugate is done. ELISA kits containing pre-coated antibody-plates, antibodies for detection, specific buffers, standards, diluents and substrates. Additionally, there are kits known as Instant ELISA kits that are available with pre-coated plates including only the capture antibody which in presence of the sample contain the essential constituents like the capture antibody and lyophilized detection antibody, streptavidin-HRP, and sample diluent. In addition, the strip wells that contain the standard for calibration are made available separately. The second type of kit is known as Antibody pair kits that are made up of individual matched antibodies and standard devoid of plates and reagents for detection. These kits are all are ready to use and are offered in several formats as well as quantitative, semi-quantitative, indirect or competitive. They are also known to give reproducible results within 90 minutes. Some kits even simplify the whole procedure by implementing protocols like one incubation – one wash, without compromising the performance of the assay in question . Also, they implement a standardised protocol for multiple purposes for ease of application. These kits are all are ready to use and are offered in several formats as well like quantitative, semi-quantitative, indirect or competitive. They are also known to give reproducible results within 90 minutes. Some kits even simplify the whole procedure by implementing protocols like one incubation – one wash, without compromising the performance of the assay in question . Also, they implement a standardised protocol for multiple purposes for ease of application. Quantitative: Data can be inferred via comparison with a standard curve which is generally a serially diluted sample of the purified known concentration of antigen. This requirement is necessary in order to accurately compute the concentrations of antigen in a given unknown sample. Qualitative: Sometimes it is not mandatory to analyse the exact concentration of analyte present in a sample instead only information about its presence or absence is mandatory in arriving at conclusions. ELISAs can be applied to attain such an analysis where it indicates whether a particular antigen is present or absent in a sample when compared to a control well without any antigen which can sometimes also be a dissimilar antigen also. Semi-Quantitative: In this format, ELISAs are compared with the relative amounts of antigen in the samples. This is so because the strength of the signal obtained will vary proportionately with antigen concentration. The data output in ELISA is characteristically plotted with respect to optical density or fluorescence/luminescence vs concentration producing a sigmoidal curve. For generation of a standard curve the amount of antigen in a known sample are exploited. Thereafter, the linear portion of the standard curve obtained in the previous step is exploited to quantify the amount of unknown antigen present in the sample. Actually, the relatively extended linear portion of the standard curve gives reproducible and accurate results in ELISA. The unknown concentration can be calculated by using plotted graph or by using software for curve fitting. When there is a requirement of a quantitative result, the easiest way to advance is by taking the triplicate average of the standard’s data and from that value deduction of the blank control sample value is carried out. In the next step the standard curve is plotted and the line of best fit is ascertained inorder to determine sample concentrations. Whatever dilution is required is to be realised at this point for adjustments. In the case where the optical density or the fluorescence signal of the sample extending the upper limit of the standard curve then the samples should be further diluted before going on with the process in order to ensure a precise result which is later on compensated by multiplying the dilution factor. Data plots can also be obtained by means of log/log, semi-log, log/logit and its derivatives. The use of software based and machine learning solutions renders it practical towards consideration of more sophisticated graphs. Linear regression can be applied via software module which contributes towards assessment of other additional important parameters like the overall goodness of fit. For that to happen the R2 values >0.99 should be applicable in the portion of the curve where the concentration has a relationship with the values. More amount of accuracy can be further inculcated using more number of concentration in making the standard curve. One of the features of the linear plot is that the data points are compressed at lower concentrations of the standard curve thereby allowing the area to be most likely to attain the essential R2 value. If this compression implies to be counteracted a semi-log chart can be applied where in the log of the concentration value is plotted against the values. This process yields an S-shaped data curve which allocates more number of data points making it an adaptable sigmoidal pattern. The log of concentration vs the log of data plot produces a data curve with a more linear portion. At concentration range low to medium the standard curve is usually linear with this type and at higher concentrations alone it inclines to slope off. The log/logit and its derivatives and other logistic models are further sophisticated that demands extra complex calculations and other estimations. With these calibration curve models an better presentation can be provided. Instead, back-fitting of the standard curve data can also be carried out in certain cases. It specifies any irregularities and inaccuracies in the results. A Large variance gives an indication of inaccuracy and error. This regulates the interference of other constituents in a sample that can cause hindrance to the detection process of the antigen by the antibody. Many proteins, chelating agents, metal ions contained biological samples may affect the binding of the antibody to the specific antigen thereby increasing the background noise, that may result in a false negative. To alleviate this known concentration of protein are spiked into both the sample matrix and a standard diluent. Quantification is carried out for the spiked protein in both the cases and the results are compared. In case the results from both are indistinguishable then the sample matrix is regarded as suitable for analysis. If the results are different then it can be concluded that the constituents of sample matrix can interfere with the detection process. ELISAs are regarded as one of the most sensitive immunoassay platforms presently available. 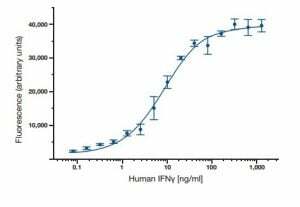 The characteristic detection range for an ELISA lies between 0.1 to 1 femtomole or 0.01 nanogram to 0.1 nanogram, wherein the sensitivity relies upon the specific physiognomies of the antibody-antigen interaction involved in the assay. Moreover, some of the substrates available which produce an improved luminescent or fluorescent signal can be applied to increase sensitivity . As discussed earlier, an indirect format of detection yields higher intensities of the output signal and are thereby found to be more sensitive compared to others although it can also produce higher background thereby leading to non-specific signals. The assay has proceeded incorrectly or the use of reagents was not appropriate. In this case, the protocol must be reviewed and the assay must be repeated with a suitable positive control. The secondary antibody used was not eligible and it is required to review and repeat the assay with the accurate secondary antibody . Amount of antibody used is not sufficient and the concentration of the primary and/or secondary antibody must be increased. The reagents used for detection may be contaminated hence, the use of fresh reagents is recommended. The coating of the antigen may be improper inorder to correct it coating can be carried out for an extended time and different buffers can be explored. The plate reader settings can be checked for correct parameters. The activity of the antibody can be lost due to repeated freeze/ thaw cycles hence, the use of fresh antibody is recommended. The concentration of antibody may be low and the optimisation of correct antibody concentration is required. The quantity of detection reagent needs optimisation. The temperature of incubation is low and optimisation of correct temperature is required before the assay is carried out. The concentration of primary and/or secondary antibody may be too high therefore reduction of concentration is required to be done. The specificity of antibody towards the target antigen is not present. The application of a proper blocking buffer or a purified antibody derived by affinity chromatography is required. Less number of washes, increasing the number of washes can solve the related issue. Use of correct proportion of blocking reagents is recommended. Washing should be carried out thoroughly before antibody binding. The concentration of primary and/or secondary antibody used is high. An optimisation is required. The concentration of detection reagent is high and dilution can solve the issue. Use of fresh blocking reagent is recommended to avoid any contamination related problems. Saturation of readings may occur if the plate is left too long before measurements. Interference from the bottom surface of the plate may lead to such issues thereby cleaning is recommended. Substrate incubation is supposed to be carried out in dark. Optimum incubation temperature should be used. Uneven temperature distribution should be avoided. Reagents should be mixed properly to avoid pipetting errors. Evaporation from the wells should be avoided by placing lid. Solutions used may be contaminated hence the use of the fresh solution is recommended. Pipetting errors may occur therefore it should be ensured that the correct volume should be dispensed every time from the pipette. Mixing of reagents between the wells may lead to error. Cross contamination of reagents and microbial contamination of samples or reagents. Temperature variations across the samples. Evaporation of samples can lead to it and can be avoided by ensuring the lid is placed. The most difficult question is to answer when initiating the use of ELISAs is, which system or type of ELISA is more appropriate. To answer this following questions must be addressed. These questions have a direct effect on the phases that might be put forward as a general rule for the development of any assay. For eg. Standardization – It is quality control and establishment that a test is precise and can be used by different workers in different laboratories. Although this is simplistic approach , the recognition as to why an ELISA is being developed is essential, which is often forgotten. Polystyrene or polyvinyl chloride flat-bottomed, 96-well plates are used in the vast majority of ELISA assays. 96-well plate comes in 8-well or 12-well strips. Alternatively a strip well plate has also been used. Other variants are 384-well and 1536-well plates. They can process more samples per plate. These are exclusively used in high throughput screening and they require automated handling. Some enzyme substrates, such as those that produce fluorescent or chemiluminescent signals may require opaque plates for optimal results. Many manufacturers supply plates designed for ELISA and provide a standardized product. The use of a wide variety of plates from different manufacturers has been reported for a broad spectrum of biological investigations. It is impossible to recommend one product as a universally accepted plate. Ideally, flat bottomed wells are recommended in which spectrophotometric readings is employed to assess color development. However round bottomed wells can be used in which visual assessment of the ELISA is made. Such plates can be read by a spectrophotometer but are not ideal. The performance of plates should be examined for a given assay on a routein basis, as it is difficult to assume that the plates will not vary in performance. It becomes an important exercise when different batches of plates are used. The batch no usually can be obtained from the boxes in which plates are provided. Standard polystyrene ELISA plates categorised into the low, medium and high binding type. Low binding plates capture around 100–200 ng of IgG/cm2 whereas high binding capture around 400–500 ng of IgG/cm2. It becomes imperative to use ELISA plates for ELISA experiments as these plates are designed to maintain consistency, minimizing edge effects and providing optimal optical conditions for data collection. Antigen or antibody pre-coated ELISA plates are also commercially available separately and also as part of an optimized ELISA kit with all components included. The antibodies used in ELISA are generally termed as primary, secondary, capture, detection etc. The antibodies can be monoclonal, polyclonal, or a combination of both. It is important to appreciate the differences between them and how these can be used. The interaction between antibodies and their antigens is described in three ways: specificity, affinity, and avidity. Antibody binding solely to a unique epitope from a single antigen in a single species, or similar epitopes present on several molecules from a few different species is called specificity. Affinity is the binding strength of an antibody to a single epitope. Affinity determines how much antigen is bound by an antibody, how quickly binding occurs, and for how long the binding lasts. High affinity antibodies produce the greatest number of stable immune complexes and therefore provide the most sensitive detection. Hence, are the best choice for all types of immunoassay. Avidity is a more complex term that accounts for the total stability of the antibody-antigen interaction. It is based upon affinity, but is also influenced by the valency of the antibody, or total number of antigen binding sites. Thus, avidity varies with isotype and whether the antibody is intact or fragmented. There is also a contribution made by the spatial arrangement of the whole complex. Monoclonal antibodies are specific for a single epitope i.e a small region of protein. As a result, they are helpful in reducing cross reactivity and are not generally expected to trigger non-specific signals in a given immunoassay. They are used in sets as matched pairs or in conjunction with a polyclonal antibody to enhance signal or to provide a greater chance of capturing antigen from a complex solution. Monoclonals have an inherent monospecificity toward a single epitope that allows fine detection and quantitation of small differences in antigen. A polyclonal is often used as the capture antibody to pull down as much of the antigen as possible. Then a monoclonal is used as the detecting antibody in the sandwich assay to provide improved specificity. If specificity is needed during binding of analyte capture antibody is monoclonal then once the plate is washed only analyte of interest remains then detection is usually a polyclonal. Polyclonal antibodies are complex antibody pools containing various epitopes of a single antigen. Due to the heterogeneity of epitopes, polyclonal antibodies can be powerful tools for the thorough detection of an antigen. It is also rare that they will fail to bind due to a single blocked antibody binding site, antigen configuration change, or misfolding. Polyclonals result in higher non-specific signal as they are more likely to share one or more epitopes with closely-related proteins. One solution to reduce this problem is to use affinity purified or cross-absorbed polyclonal antibodies. Sometimes the detection method for an ELISA is switched from direct to indirect detection, and thus from a monoclonal to a polyclonal, in order to increase assay sensitivity due to higher levels of polyclonal antibody binding to the target antigen. They can be used as capture and detection antibodies. Antibodies from the same polyclonal batch can both capture the analyte and subsequently also detect it, in a biotin conjugated format. Polyclonal antibodies being poly-specific may tend to capture other structurally similar molecules that may have some small resemblance the antigen of interest. This in turn which lead to false positive results. Polyclonals can vary significantly from batch-to-batch, and must be tested and validated thoroughly. Buffers can be produced in house or sourced from a variety of commercial antibody and reagent suppliers. Blocking is a necessary step in ELISA to prevent the non-specific binding of detection antibodies to the multiwell plate surface itself. Proteins and detergents are two main types of blocking agents. Proteins are classified as permanent blocking agents and hence added after the capture antibody has adsorbed to the well surface. Detergents only block temporarily, meaning their blocking function disappears during washing steps. Identifying a blocking buffer is completely users choice which has two main considerations namely reducing the nonspecific binding i.e. background and desired sensitivity. Blocking agent can consist of an unrelated protein or a protein derivative that does not react with any of the antibodies used in the detection step. When a plate is fully blocked, assay sensitivity will be enhanced since additional non-specific signal will be reduced. The most commonly used blocking buffer contains 1% BSA or milk proteins dissolved in PBS. Usually 150 – 250 μl of blocking buffer is added to the well to incubate for one hour at 37°C in order to fully block the plate. ELISA wash steps remove unbound nonspecific materials and are very important component of ELISA protocol as ELISA uses surface binding for separation. The wash buffer is generally PBS, with a small concentration of a non-ionic detergent such as Tween-20. 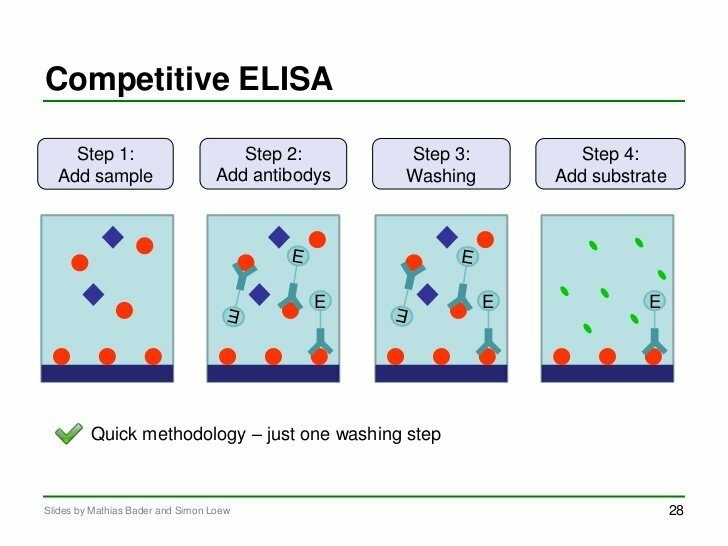 Washing is typically repeated 3-5 times between each step in the ELISA, with 30 second incubation for each wash step to thoroughly remove unbound nonspecific material. It has been observed that more number of wash is of significance than more time of wash incubation. In the final wash step excess of wash solution must be removed to prevent the dilution of the reagents added in the subsequent stage. Simply tapping the washed plate upside down on an absorbent paper helps to remove excess liquid. It is crucial not to let the plate dry out. Controls are very important for performing ELISA as they help in several ways. Different controls have different functions to play. Based on the function controls are named as negative, positive and standard. In an ELISA experiment blank wells are the ones where only primary antibody is excluded and other components are added. Blank wells don’t show any color. In some cases blank and negative control are same. The negative control in an ELISA test means a sample known not to express the protein of interest. This helps to check for non-specific binding and false positive results. Each experiment should contain a negative control sample in order to validate the results. In an ELISA test, positive control has an important role to play. A positive test for positive control indicates that the protocol is working fine. It will verify that any negative results are valid. A positive control can be an endogenous soluble sample known to contain the protein being detected. A purified protein or peptide known to contain the immunogen sequence for the antibody being used, can also be a positive control. Any tissues, cells or lysates that have been used successfully can be considered a suitable positive control. A sample containing a known concentration of a protein from which the standard curve can be obtained. Then this standard curve can be extrapolated in order to calculate the unknown concentration of the protein. To get accurate result all ELISA experimental samples are processed in triplicates. Output in an ELISA experiment are mostly qualitative, however it can be quantitative and semi quantitative also. For quantifying results from ELISA a standard curve is needed. In case of qualitative ELISA, we can get a yes or no answer which is indicative of presence or absence of a particular antigen in a sample. This interpretation is done in comparison to a blank well which doesn’t contain antigen or contains an unrelated control antigen. On the other hand for quantitative ELISA results, output data has to be interpreted in comparison to a standard curve (a serial dilution of a known, purified antigen) in order to precisely calculate the concentrations of antigen in various samples (Figure 1). In semiquantitative ELISA, the relative levels of antigen in assay samples are compared, since the intensity of signal will vary directly with antigen concentration. ELISA data is typically graphed with optical density vs log concentration to produce a sigmoidal curve as shown in Figure 1. A standard curve is plotted using known concentrations of antigen and then this data is used to measure the concentration of unknown samples by comparison to the linear portion of the standard curve. This can be done directly on the graph or with curve fitting software which is typically found on ELISA plate readers. For quantitative result, the reading of the blank control sample is deducted from the average triplicate of the standards readings. With the standard readings a standard curve is plotted and the line of best fit is obtained. A point to point curve can also be plotted so that the concentration of the unknown samples can be determined manually. If any dilutions are made should be adjusted before plotting. Standard curve can be plotted using semi-log, log/log, log/logit and its derivatives – the 4 or 5 parameter logistic models. Using software based/automated solutions makes it possible to consider more sophisticated graphing approaches. Using linear regression within a software package it is possible to check the R2 value to determine overall goodness of fit. For that portion of the curve where the relationship of concentration to readout has a linear relationship, R2 values >0.99 represent a very good fit. One aspect of the linear plot is that it compresses the data points on the lower concentrations of the standard curve, hence making that the most accurate range (area most likely to achieve the required R2 value). To counteract this compression a semi-log chart can be used; here the log of the concentration value (on x-axis) is plotted against the readout (on y-axis). This method gives an S-shaped data curve that distributes more of the data points into the more user friendly sigmoidal pattern. The log/log (log of concentration against log of readout) plot type manages to linearize more of the data curve. The low to medium standard concentration range is generally linear in this model, only the higher end of the range tends to slope off. The log/logit and its derivatives, the 4 or 5 parameter logistic models, are more sophisticated requiring more complex calculations and estimations of max, min, EC50, and slope values. The 5 parameter model additionally requires the asymmetry value. While these calibration curve models can deliver improved performance, a good starting point would be using the log-log plot. Consistency of results in any assay is an important aspect for which experimental conditions need to be standardized. Maintaining consistency helps to achieve reproducibility and accuracy. During an assay development it is imperative to test a range of parameters, in order to find the best suited experimental conditions. Capture and detection antibodies dilutions needs to be optimized in systematic manner. In addition, buffers, temperature, and humidity must be kept constant between and within experiments in order to produce standardized results. There are few requirements such as multiwell plates, multichannel pipets, and plate washers for a typical ELISA where sample size is high. These accessories help to provide consistent and faster results, as well as higher throughput. A very important checkpoint is to ensure the pipettes used are calibrated properly and on regular basis as it helps to prevent significant variation in the results. While working with multichannel pipettes few points should always be checked .Observe the level of the liquid in the pipet tip and the wells while performing the experiment to make sure no sample is far out of line with the others. As in multi-channel pipets sometimes the tips in the end rows do not always attach fully to the pipettor. So, these must be kept in mind otherwise reproducibility of the experiment will get affected. Plastic surfaces have a finite capacity for adsorption. The exact nature of protein influences its capacity to attach to microplate wells. A saturation level of 50 to 500 ng per well have been found valid for a variety of proteins when added as 50 ul volumes. By increasing volume of attaching protein the effective weight of protein per well can be increased which increases the surface area of the plastic in contact with the coating antigen. The adsorption process is nonspecific whereas antigen antibody interaction is very specific. Hence, any substance may absorb to the plastic matrix at any stage of ELISA assay. This must be kept in mind while assay designing because reagents may react with such substances. Nonspecific binding can be alleviated to a great extent through choosing systems which rely on direct adsorption of antigen such as sandwich technique in which specific ab capture and concentrate specific antigen. Plasma and serum are complex samples containing several components. Matrix effects occur most often in plasma and serum samples where a series of components can cause interference. The cross-reactive substances in plasma or serum can lead to non-specific interactions in the matrix. Also the breakdown products that develop during the sample handling process can lead to nonspecific interactions. Matrix effect can be reduced by dilution of the sample; this should be verified by analyte recovery from spiked samples. Specialized buffers for sample dilution, coating, blocking and washing can ameliorate matrix effects and provide constant performance. The initial task for optimization of ELISA protocol is to determine working concentrations for the antibodies. Prepare capture antibody dilutions in coating buffer at 0.5, 1, 2 and 5 μg/ml, then follow standard procedure. At the stage where sample addition would occur, add a high and low concentration of analyte that reflects the expected working range. For the detection antibody dilutions at 1:200, 1:1,000, 1:5,000 and 1:25,000 in buffer should be tried. Including a high and low concentration of the analyte helps to determine the dynamic range. The low concentration analyte indicates the sensitivity of the assay. If the blank sample shows excessive reading, above 0.2 absorbance units, these key components need to be checked for optimization: ELISA plate type and the blocking and washing buffers. If the background readings are appropriate but the sensitivity is not high enough further experimentation with matrix conditions, buffers, and incubation timings should be carried out. However, if no improvement is possible different antibody combinations need to be generated. An ELISA reader measures and quantitates the color differences in the wells of the ELISA plate. ELISA readers also known as micro plate readers do spectrophotometry; they emit light at one wave length, and measure the amount of light absorbed and reflected by an object such as a protein. A spectrophotometer measures ultraviolet and visible light. ELISA plate readers can also measure fluorescence and luminescence. Chemical dyes fluoresce or emit one color or wavelength when exposed to light. The amount of reflection, absorption and the color identify, and measure the amount of a substance. ELISA reader has an edge over spectrophotometer as they require more sample per measurement. To use a spectrophotometer or ELISA plate reader, the molecule must be dissolved in solution. A spectrophotometer requires between 400 micro-liters to four milliliters, depending on the manufacturer and model. An ELISA plate reader needs about two to 100 microliters. ELISA plate readers measure more samples in a shorter period of time. A spectrophotometer measures one to six samples at a time. Typically, an ELISA plate measures 96 wells in an equivalent amount of time. The antigen is diluted to a final concentration of 20 μg/ml in PBS. The wells of a PVC microtiter plate are coated with the antigen of 50 μl in the top wells of the plate. The plate is covered with adhesive plastic and incubated for 2 hours at room temperature. The coating solution is discarded and completely removed by flicking the plate over a sink and the remaining drops are removed by patting the plate on a paper towel. The remaining protein-binding sites in the coated wells are blocked by adding 200 μl blocking buffer. The plate is covered with an adhesive plastic and incubated for at least 2 hours at room temperature. The plate is washed twice with PBS. 100 μl of the antibody is added to the blocking buffer before use. The plate is covered with an adhesive plastic and incubated for 2 hours. The plate is washed four times with PBS. the substrate solution is dispensed in each well. Post color development, stop solution is added to the wells. Absorbance of each well is studied against a plate reader. The antigen is diluted to a concentration of 20 µg/ml in PBS. The wells of a PVC microtiter plate are coated with the antigen by pipetting 50 µl of the antigen dilution in the top wells of the plate. 200 µl blocking buffer is added to block the remaining protein-binding sites in the coated wells with 5% non-fat dry milk. The plate is covered with adhesive plastic and incubated for at least 2 hr at room temperature. 100 µl of diluted primary antibody is added to each well. The plate is covered with an adhesive plastic and incubated for 2 hours at room temperature. 100 µl of conjugated secondary antibody diluted at optimal concentration in blocking buffer is added. The plate is covered with adhesive plastic and incubated for 1 – 2 hours at room temperature. Again, the plates are washed with PBS four times. The wells of the microtiter plates are coated with the capture antibody at 1–10 μg/mL concentration in carbonate/bicarbonate buffer. In case unpurified antibodies are used, the concentration of the protein sample should be 10 μg/mL) to compensate for the lower concentration of specific antibody. The plate is covered with adhesive plastic and incubated at 4°C for 12 hours. The coating solution is discarded and the plate is washed twice by 200 μL PBS. The PBS is also removed completely by flicking the plate over a sink and the by patting the plate on a paper towel. The remaining protein binding sites in the wells are blocked by 200 μL blocking buffer (5% non-fat dry milk/PBS) per well. The plate is covered with the adhesive plastic and incubate for at least 2 hours at room temperature or overnight at 4°C. The plate is washed twice with 200 µL PBS. The diluted samples of 100 μL is added to each well. The signals exhibited are compared with a standard curve. Both standards and blank with each plate are incubated for 90 minutes at room temperature. The concentration range is optimized to obtain a standard curve. This ensures the standards spans the detection range of antibody binding. the samples are removed and the plate is washed twice with 200 μL PBS. 100 μL of diluted detection antibody is added to each well. It is important to ensure detection antibody recognizes a different epitope on the target protein to the capture antibody to prevent interference with antibody binding. The plate should be covered with adhesive plastic and incubated for 2 hours at room temperature. The plates are washed with PBS four times and 100 μL of conjugated secondary antibody diluted in blocking buffer is added. The plate is covered with adhesive plastic and incubated for an hour at room temperature. Detection involves enzymes such as Horse radish peroxidase (HRP) and alkaline phosphatase (ALP). Blocking treatment with levamisole or 0.3% H2O2 in methanol. This helps in hindering nonspecific signal. The assay is the most precise of all ELISA variants. Unlabeled antibody is incubated with the sample antigen. The unbound antibody is washed away from the plate. More antigens in the sample leads to lesser antibodies binding to the antigens in the well, hence the procedure is termed competitive. Secondary antibody conjugated with the enzyme is added to the well. A suitable substrate is added and enzymes elicit a chromogenic or fluorescent response. The assay is usually carried out in two stages. Like Direct ELISA, the antigen is coated to a polystyrene multiwell plate. In the first stage, unlabeled primary antibody is introduced into the well which is specific to an antigen. In the second stage, enzyme labeled secondary antibody (often polyclonal antibody) is introduced to the well. The advantages of Indirect ELISA include enhanced sensitivities since more than one labeled antibodies are used for bounding with primary antibody. The experimental procedure can be made flexible as per the demands of the study given the stages in Indirect ELISA. The assay is highly efficient in sample antigen detection and quantification. The assay is suitable for antigens that contain at least two antigenic epitopes capable of binding to antibody. Both monoclonal and polyclonal antibodies are widely used as capturing and detection antibodies in Sandwich ELISA systems. The quantification of antigens happens between two layers of antibodies and therefore the method is termed as sandwich ELISA. The assay is more sensitive and specific than direct or Indirect ELISA i.e. up to 2 to 5 times. The difficulty in sandwich ELISA lies in optimization and selecting tested pair antibodies. This ensures antibodies chosen are detecting different epitopes on the target protein without interfering with other antibody binding. As a high precision assay, the sample need not be purified before analysis.